"CHIPS: AMD accelerates 3D workstations"
3D stereographic imaging--popular for computer-aided design (CAD), medical imaging and digital content creation--has harnessed the capabilities of Advanced Micro Devices' latest graphics processor chipset on the ATI FireGL V7700 professional graphics accelerator card. Capable of creating photorealistic visualizations of real-world objects and environments on stereoscopic displays, the new accelerator is the first commercially available 3D workstation card to support 3D on DisplayPort--the latest digital display interface standard by the Video Electronics Standards Association (VESA). "PODCAST: Week-in-Review, March 28, 2008"
Welcome to Week-in-Review by R. Colin Johnson. Here I review the week's tops stories as compiled from interviews I do for EETimes--where you'll find global news for the creators of technology at EETimes.com. This week my top stories include how carbon could enable the world's fastest chips, how hyper-entangled photons claim the world's record for bit-encoding density, how WiMax will make its initial flight at the airport and how Openet is pioneering the next-generation of wireless applications. "WIRELESS: Openet pioneers next-gen wireless/wired"
Wireless, wireline and cable network operators all face a common obstacle to providing multimedia services using the new 3G- and 4G-based devices--namely, how to track real-time usage. To gain access to the rich new revenue streams enabled by WiMax and the Internet Protocol Multimedia Subsystem (IMS), operators must combine service delivery with billing functions, which traditionally have been run by different parts of their organizations. To the rescue is coming a new breed of transaction-tracking software companies. Openet, for instance, supplies the FusionWorks Framework engine to AT&T for its new-age Smart Limits service. Smart Limits allows subscribers to specify their own unique rules for limiting network usage, such as setting certain hours of the day for text messaging so that teenagers don't abuse the service after hours. Likewise, to provide the real-time video, gaming, social-networking and other "postpaid" services over next-generation 3G and 4G networks requires dynamic policies that let subscribers make up their own rules governing real-time transactions. "QUANTUM: Hyper-entangled photons claim bit-encoding record"
A new world record has been claimed for encoding information onto a binary property of light, according to researchers at the University of Illinois. By "hyper-entangling" photons--that is, using quantum entanglement with multiple degrees of freedom--Professor Paul Kwiat, doctoral candidate Julio Barreiro, and postdoctoral researcher Tzu-Chieh Wei (now at the University of Waterloo) claim to have encoded 1.63 bits per photon. The previous world's records were 1.13 bits per photon without hyper-entanglement, out of a theoretical limit of 1.58 held by Professor Anton Zeilinger at the University of Vienna (and 1.18 with h hyper-entanglement out of a theoretical limit of 2 held by Professor Harald Weinfurter at the University of Munich, Germany). By combining Hyper-entanglement and linear optics, Kwiat, Barreiro and Wei, claim that 2.81 bits per photon could be encoded to someday increase the channel capacity of satellite-to-satellite data transmissions by more than 3.5 times. "MATERIALS: Carbon could enable fastest chips"
Carbon transistors could outperform the fastest chip materials, including indium antimonide, according to researchers at the University of Maryland. 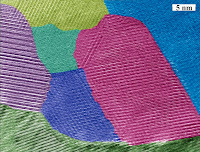 The College Park team recently characterized graphene monolayers, sheets of pure carbon just one atom thick. 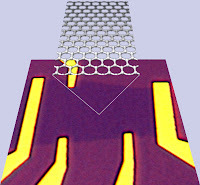 They discovered that graphene appears to be unphased by temperature, unlike most semiconductors. Usually, speed--called electron mobility--is proportional to temperature (the colder the better since fewer lattice vibrations, called phonons, can scatter flowing electrons). Instead, pure graphene transistors appear able to achieve their maximum possible speed at room temperature, according to the researchers, if chip makers choose the right substrate. 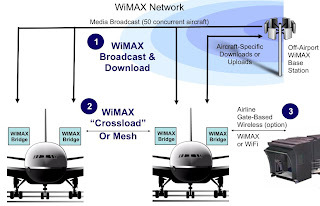 "WIRELESS: WiMax to make initial flight at the airport"
WiMAX's first commercial rollout could be at airports, updating manifests, flight plans and onboard entertainment each time a plane lands. Called GateSync, the WiMAX-based technology hardware will be manufactured by Thales Avionics, Inc. (Cedex, France, formerly Thomson CSF), and use wireless software from Proximetry, Inc. (San Diego, Calif.), and a beam-steerable phased-array antenna from Pinyon Technologies, Inc. (Reno, Nev.) Today, airlines use "sneaker-net" to update onboard manifests, flight plans and in-flight entertainment files: in other words, a person wearing sneakers (for speed) carries either a laptop or a stack of tapes to each plane after it lands and physically uploads the necessary information into airliners' computers. Now, by using WiMAX, airliners can automatically sync their onboard computers via GateSync software running on Thales Avionics ground-based computers. "PODCAST: Week-in-Review, March 21, 2008"
Welcome to Week-in-Review by R. Colin Johnson. Here I review the week's tops stories as compiled from interviews I do for EETimes--where you'll find global news for the creators of technology at EETimes.com. This week my top stories include how a silicon compound aims to superconduct at room temperature, how carbon beats copper at 45 nanometers, how nanotechnology is boosting the thermoelectric effect, how FlatWire aims to short-circuit wireless personal area networks, and how telematics hitching a ride to 44% penetration of the automotive market. Thermoelectric coolers and power generators were handed a 40-percent boost in performance recently by a nanotechnological reconstruction of a classic bulk material. The technique is suitable for mass production, according to its inventors at Boston College and the Massachusetts Institute of Technology (MIT), making it useful in both industrial and consumer cooling applications--from semiconductors to nanoscale power generators. The material improved by the researchers is used in a variety of applications from generating power for remote spacecraft to cooling automobile seats during summer heat waves. The auto industry has also been experimenting with ways of converting the heat from can exhausts into electric current that charges the batteries of hybrid cars. Now all these applications, and other new ones, could be boosted by a 40-percent efficiency gain. "ALGORITHMS: Telematics hitching a ride to 44% market penetration"
Telematics systems are quickly becoming standard equipment on new passenger vehicles, according to ABI Research (Oyster Bay, New York), which predicts that 30 million new cars will have onboard telematics units by 2013. Telematics, such as General Motors's OnStar and Ford's Sync, benefit consumers by combining global positioning systems with wireless communications technologies for remote diagnostics, concierge services and remote door unlocking, thereby increasing safety, lessening environmental impact and providing infotainment and convenience. OnStar and Sync are slated to become standard equipment on U.S. automobiles, and in Europe eCall (an automated emergency reporting system) is being proposed as mandatory in vehicles by 2011. According to ABI Research, the wide availability of GPS technology and worldwide flat-fee data communication fees is driving the market, as are aftermarket telematics systems that offer stolen vehicle tracking, "black box" insurance-related applications and handset-based tracking and speed monitoring to help keep track of the family teenagers. "MATERIALS: FlatWire aims to short-circuit WPANs"
Copper wire maker FlatWire Technologies claims it has pre-empted the need for complex, expensive new wireless technologies--such as 60-GHz wireless personal area networks (WPAN)--with a simpler, cheaper solution that is available today. 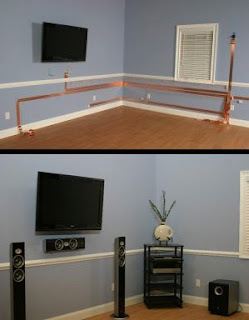 As a division of North America's biggest manufacturer of electrical wire and cable--Southwire Company (Carrollton, Ga.)--FlatWire claims to solve the same problems as WPAN, such as cutting the clutter behind equipment and obviating the need to pull cable through walls, with flat copper wiring that is glued to walls and ceilings, then made nearly invisible with a simple coat of spackle and paint. 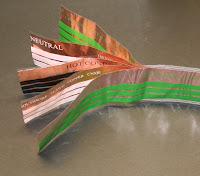 FlatWire--composed of thin strips of copper encapsulated in transparent insulators--was recently written into the National Electric Code (NEC), thereby making it eligible for widespread adoption. FlatWire is currently undergoing the voluntary listing process with Underwriters Laboratory (UL), which is expected to be completed by the end of 2008. 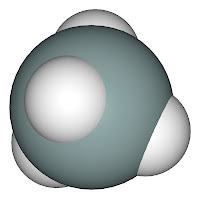 "MATERIALS: Silicon compound aims at room temperature superconducting"
A new superconducting material fabricated by a Canadian-German team has been fabricated out of a silicon-hydrogen compound. Instead of super-cooling the material, as is necessary for conventional superconductors, the new material is instead super-compressed. The researchers claim that the new material could sidestep the cooling requirement, thereby enabling superconducting wires that work at room temperature. "PODCAST: Week-in-Review, Mar. 14, 2008"
"MATERIALS: Carbon beats copper at 45 nanometers"
Carbon nanotubes outperformed copper interconnects at the 45-nm process node, according to Rensselaer Polytechnic Institute researchers. In what is billed as the world's first supercomputer simulation to include detailed quantum mechanical effects, the New York state researchers concluded that the ideal performance of copper interconnects cannot be met at 45 nm and smaller sizes. The reason, they said, was excess heat generation. By switching to carbon nanotube interconnects, the heat problem was solved, they added. "SECURITY: iPhone ups ante for security software"
Apple's iPhone and Microsoft CE-based devices are upping the ante for security software in embedded systems, according to experts presenting at the Cellular Telecommunications and Internet Association (CTIA) Wireless conference next month (April 1-3, 2008, Las Vegas, Nev.) Embedded security software has become essential to these open-system-based mobile devices, as they grapple with traditional security in addition to new concerns, such as providing a safe execution environment for third-party applications. Once handled by in-house programmers, mobile-device makers are now turning to security software companies to provide these multi-level safety nets for personal data, digital rights management and authentication tasks. 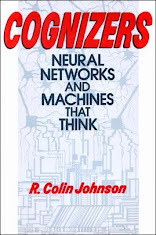 "ALGORITHMS: AI researchers think 'Rascals' can pass Turing test"
Passing the Turing test--the holy grail of artificial intelligence (AI), whereby a human conversing with a computer can't tell it's not human--may now be possible in a limited way with the world's fastest supercomputer (IBM's Blue Gene), according to AI experts at Rensselaer Polytechnic Institute. RPI is aiming to pass AI's final exam this fall, by pairing the most powerful university-based supercomputing system in the world with a new multimedia group designing a holodeck, a la Star Trek. "ROBOTICS: Space station gets major robot arm upgrade"
Space Shuttle Endeavor, which roared off the pad early Tuesday (March 11), is carrying a Canadian-built humanoid robotic arm with unprecedented dexterity for a space robot. 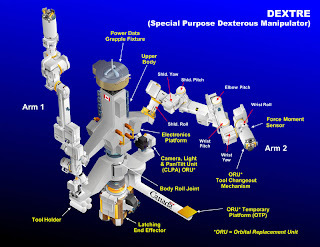 The Special Purpose Dexterous Manipulator, or Dextre, was launched as part of a shuttle mission to the International Space Station. The orbitor is also carrying the Japanese Kibo laboratory module. Dextre has has an upper body that pivots at the waist and shoulders that support two identical arms, each with a hand with seven joints. NASA said Dextre will be able to assemble and repair space station equipment that previously required lengthy space walks by astronauts. "CHIPS: Antipiracy scheme aims to protect chip makers"
An anti-piracy scheme aims to reduce the temptation to illegally copy integrated circuits, by requiring that chips be securely activated with a lock-and-key mechanism before use. 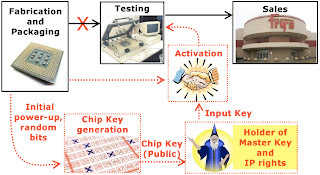 By adding security blocks to chips, patent holders could require activation before newly manufactured chip can function. "PODCAST: Week-in-Review, Mar. 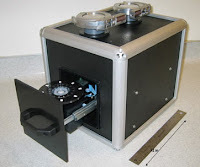 8, 2008"
"ALGORITHMS: Atomic clocks plumb cosmological mysteries"
Quantum clocks were recently harnessed to outperform current atomic clocks by 10 times at the National Institute of Standards and Technology (NIST). By coupling the quantum states of trapped ions (electrically charged atoms), their natural vibration frequencies were synchronized to 17 digits of accuracy-the most ever measured. Based on aluminum and mercury ions, the new clocks stay accurate to within 1 second every billion years, compared with 80 million years for the current atomic-clock standard at NIST. According to NIST, such ultra-accurate clocks are useful for synchronizing telecommunications networks, space navigation, satellite positioning and deep-space communications, and could enable new types of gravity sensors for exploring underground natural resources here on Earth. Physicists also hope to use the new clocks to plumb cosmological mysteries, such as whether the ultimate yardstick in nature--the fine-structure constant (a dimensionless quantity that characterizes the strength of electromagnetic interactions)--is changing over time. "MATERIALS: IBM claims noise reduction for graphene FETs"
Reducing noise in advanced graphene transistors by 10 times can be achieved with a novel by-layer architecture, according to researchers at the T. J. Watson Research Center at IBM Corp. (Yorktown Heights, N.Y.). As transistor dimensions are reduced below 32 nanometers, noise becomes a big problem for all devices in any material--a problem that follows Hooge's rule. But if ways can be found to sidestep Hooge's rule and reduce that noise, then the higher speeds of smaller devices can be combined with increases in signal-to-noise ratio. 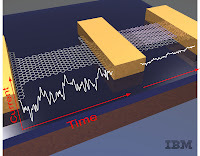 IBM now claims to have found the solution for graphene transistors. "WIRELESS:Security upgrade in works for cognitive radio"
Securing cognitive radio users is the focus of a new research effort at The Virginia Tech (Blacksburg). EE professor Jung-Min Park has received a $430,000 National Science Foundation (NSF) Faculty Early Career Development Program Award to support his efforts to secure future cognitive radio spectrum. "SENSORS: Sensor uses mice cells to detect anthrax and more on the fly"
"ALGORITHMS: U.S. launches exaflop supercomputer initiative"
A government-backed institute is aiming to create next-generation exaflop computer architectures. The Institute for Advanced Architectures has received $7.4 million in funding from the National Nuclear Security Administration and the Energy Department's Office of Science. Sandia National Laboratory (Albuquerque, N.M.) and Oak Ridge National Laboratory also will collaborate on designing waht is billed as the world's first exaflop supercomputer. 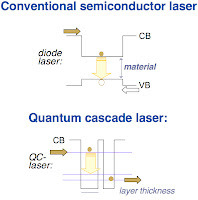 "OPTICS: Plugging the laser gap"
Semiconductor lasers emit at wavelengths from 375 nanometers to 1.8 microns (1,800 nanometers), but then skip to wavelengths of about 4 microns. In that gap, current semiconductors appear to be incapable of lasing. Now researchers at Binghamton University in New York claim to have devised a strategy to bridge the lasing gap with new materials and architectures that could enable applications not now possible. "PODCAST: Week-in-Review, Mar. 1, 2008"